I was gifted a float experience courtesy of Cloud 9 in exchange for an honest review. All opinions are my own. I’ve been at a couple of spas lately (usually massage cause my back/shoulders are being killed to death by desk job) and I always walk by a room with a big egg shape bathtub. Always curious, but too scared to try. 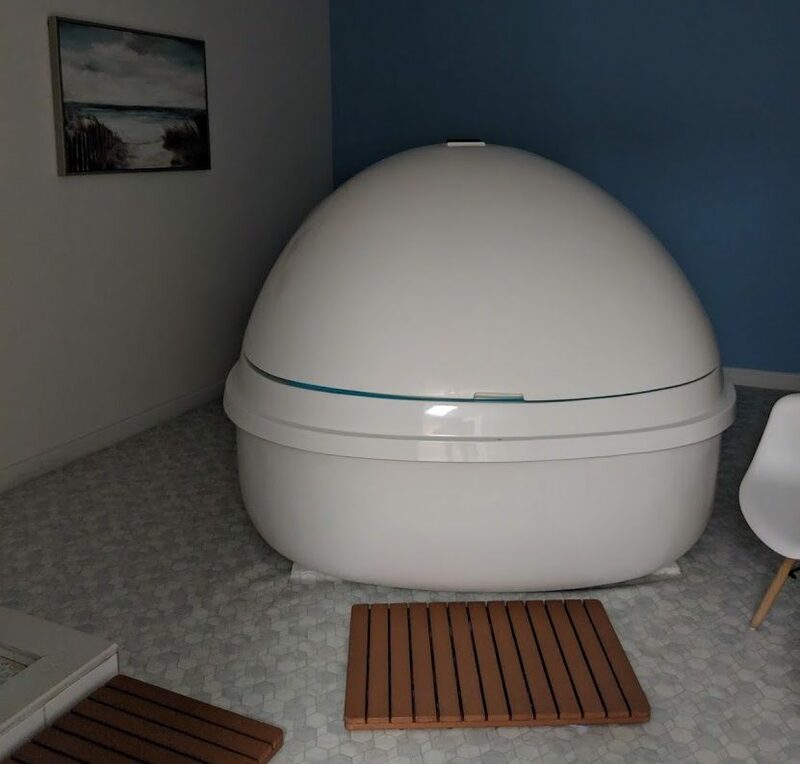 This egg pod is part of a new trend in spa therapy called Float Therapy. What is Float Therapy? The benefits are said to be wellness, relaxation, pain relief and better sleep. But at the core of it, it is 1,000 pounds of salt in a tank of 180-200 gallons of water that creates a 30% salt solution, enabling you to float effortlessly atop the water. Kinda like the Dead Sea only you don’t have to go all the way to Israel to try. 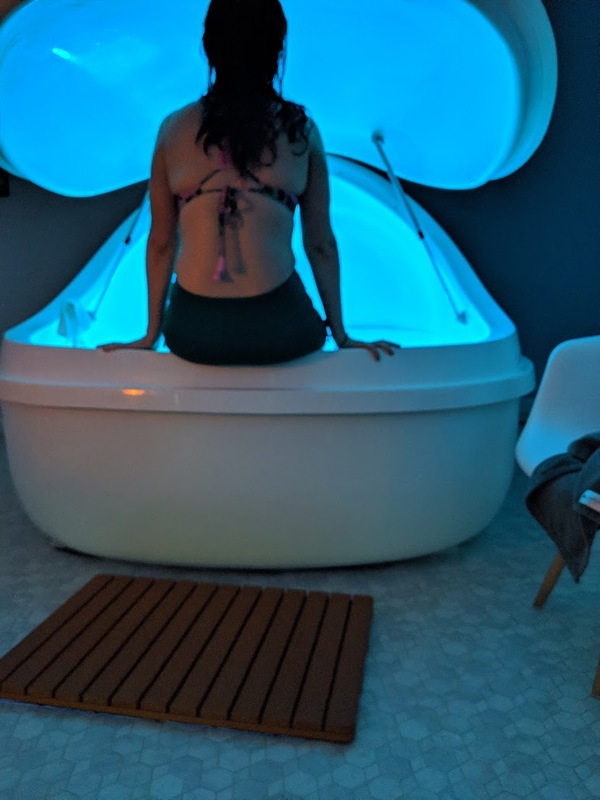 So when I had a chance to try out Cloud 9 Float & Wellness in Boston, I decided to conquer my fear of getting trapped in that thing and maybe even see if its as magical as everyone been telling me. So one day after wanting to rip my hair out at work, I ventured on the orange line from Back Bay Boston for a 20 minute ride to Forest Hills. About a 5 minute walk from the train stop, I found the family owned business on South Street in Jamaica Plain. Both owners were working with clients as I looked around the space to sign in. Alex greeted me and had me exchange my kicks for some cushy waterproof slippers. Since it was my first time and I clearly looked out of my element, he had me watch a 5 minute animated info guide. I am not a very good listener but I tried to learn the benefits I should be experiencing as I try to relax, count to 300 and if can be avoided, don’t splash myself in the eyes. As I was getting ready to go for my float, Alex’s mother who is the co-owner said they had a cancelation for the infrared sauna and asked me if I wanted to try it out for 30 minutes. Never one to refuse a deal or a sauna, I agreed. 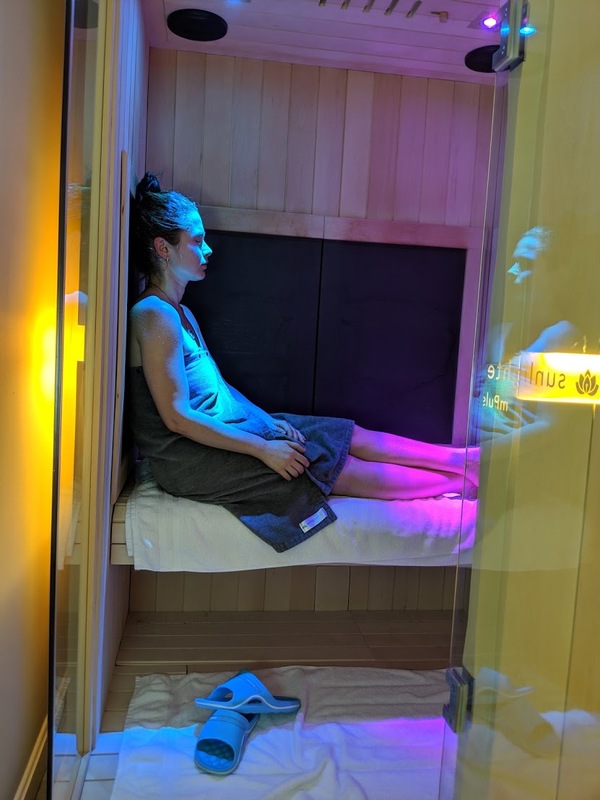 The infrared sauna uses light to create heat. It is dryer and lower temperature than a typical sauna and causes reactions similar to those elicited by moderate exercise, such as vigorous sweating and increased heart rate. There was also different lights for light therapy, but I was just content listening to some music while I sweated out the toxins of my day, week, year. I’m a big Sauna fan and loved how much easier it was to stay in an infrared compared to a traditional sauna. There is also a shower in the room to rinse of and refreshen when done. I loved that each service had it’s owner shower so you never had to go to a locker room. After the sauna, I was walked into a private room with a shower, float tank, and all the essentials (toiletries, ear plugs, etc) . I got my final ask if I have anymore questions and then was left to be. You start of with taking a shower to remove some of your body oils. I was super nervous about my hair bleeding or my color being eroded by the salt so I researched a bit before I went. It was recommended to fully soak my hair in the shower and a silicon swim cap should help. The next step was to put in the ear plugs they provide and than you enter the tank. I actually started with all the lights still on. In the pod there is a switch to close the pod and turn on/off the light. Since the room is private, you are actually encouraged to be nakie but I felt more comfortable in my bathing suit so in the tune, you do you. Upon first entry, the water felt warm like a bath as I anxiously went belly up. There was a headrest float available if I needed, but once I got into the belly up formation, my head seemed to just know where to float on its own. My first thought was wooowwww this feels amazing on my back and I started to stretch a bit (but carefully cause the fear of splashing water into my eyes was real, although they do provide a water bottle should that happen to help clean out the salt). 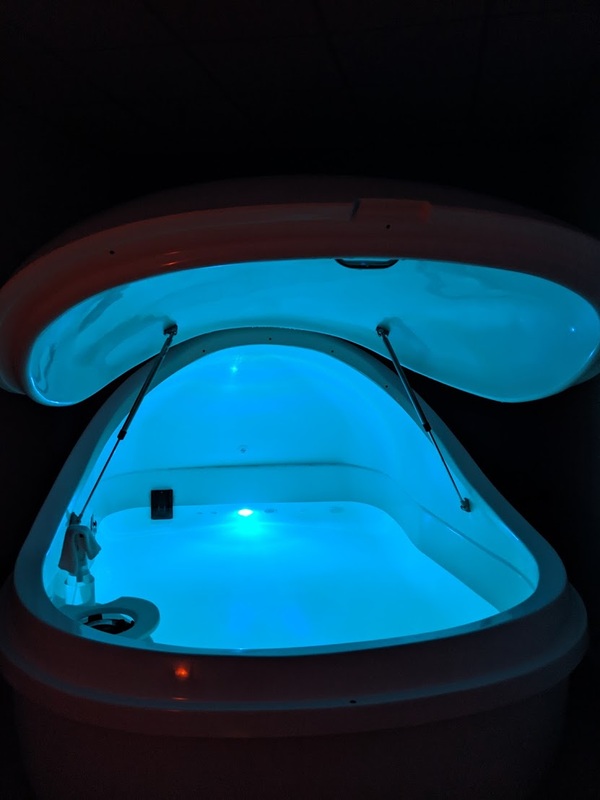 As I eased into comfort, my body was adjusting to the water that was body temp as well and I was now ready to go the next step, turning off the blue light of the pod. And my anxiety came on again as I played around with what position I wanted me body in – from the mummy, to whatever else they showed in the info video. In the end, I found that what I started with, Shavasana like belly up float was the most comfortable for my body. My mind on the other hand was racing… about work, about my to do list, about a training plan for a BQ, what to eat for the next week, worrying that this float was cutting into time I could be running/training, everything and anything . I tried counting to 300 but every 20 numbers or so I went back into mind racing thoughts that could only be causing more anxiety then relaxation. It sort of became a tug of war, I told my mind to relax, it would do the opposite, I’d tried to count and repeat. I have to confess.. at one point, I pulled up and checked my watch thinking I must be almost done. I was only 21 minutes into my soak! You can leave at any time, but if there’s one thing I try to avoid, it’s a DNF. So never a quitter, I returned to my belly up stretching which was the only trick that worked to relax me and started counting to 300 all over again, each time i wavered, I didn’t let my thoughts finish, but went back to the number I thought I left off at and continued to count off into nothingness. At one point, the idea of closing the pod came, but I was too nervous that without my glasses, I wouldn’t find the switch to open it again and I was finding some Zen and didn’t want to ruin in by fiddling with all the buttons. I honestly don’t know where my mind went but I zoned out somewhere for 30 minutes because before I knew it, a low light that indicated my 60 minutes were up came on. Maybe I napped? Float therapy black out? Is that a thing? I slowly eased my way out and into the shower. I was feeling pretty relaxed and lazy and wanted a bed a lot more than a shower, but a shower was definitely needed for all the salt I probably had on me. 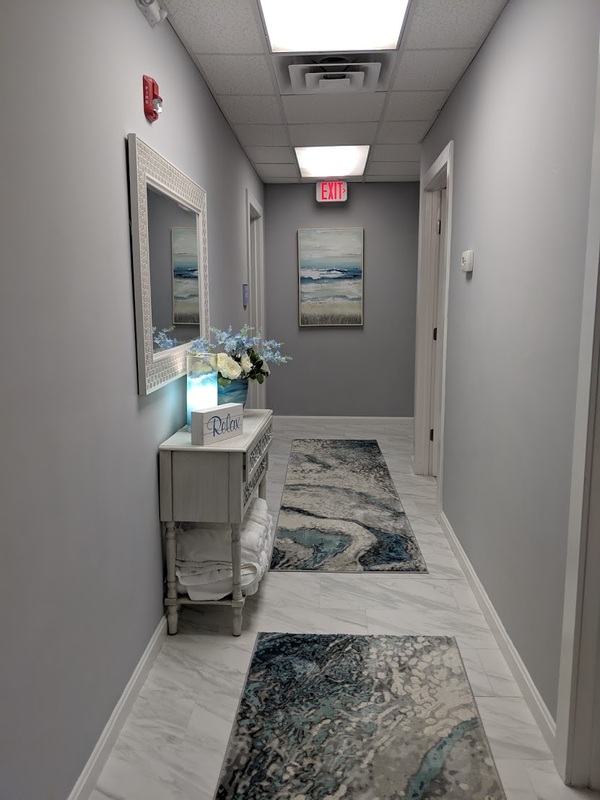 There’s a lot of benefits to float therapy that are listed on the Cloud 9 Website and as with most therapy, you do need to go regularly to really feel the physical and mental benefits. 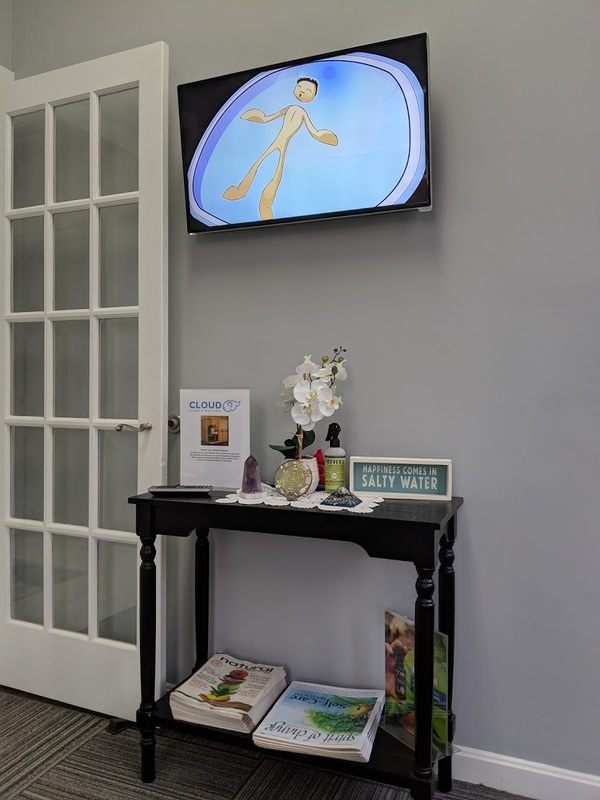 I was also told that floating regularly also helps reach the meditative state more easily than what I experienced which is why they also offer 90 minute floats for the more experienced. I never even meditated for 10 minutes before this so IMO, that was a grade A floating performance for Liana. I am not sure if my brain ever reached the step where it is suppose to increase creativity. They say 40 minutes into a float the brain stops producing its normal Alpha and Beta waves and starts going deeper into a Theta or Delta state. I am not sure I got there on my first float, but I plan on trying a few more to find out. So I whined and I whined and eventually I went for an MRI to try to figure out what exactly is going on in my heel. And all in all, only thing they found is a very angry inflamed plantar fascia, so I am now officially, one of the many runners plagues with the horror and nightmare that is plantar fasciitis. I didn’t want to believe it since the pain wasn’t in my arch and was just staying in a very acute place in the heel, but I guess MRIs can’t lie. Speaking of MRIs, have you ever been in one? It’s one of the most archaic looking devices. It reminds me of what the 1960s thought the future would be like! Now the less, they are pretty cool. Most of the human body is made up of water molecules, which consist of hydrogen and oxygen atoms.. During a magnetic resonance imaging (MRI) scan, you lie in a strong magnetic field and radio-frequency waves are directed at your body. This produces detailed images of the inside of your body. It took about 30 minutes as I tried my best to lie still and not move my foot. It would make these loud beeping sounds, about 5 different kind, and each of these sounds represented different images it took. It was a pretty cool experience! Yay for health insurance! I know at some point, I will have to take a running break, again! I’m not looking forward to it. In the meantime, I am trying to stretch as much as I can. Foam roll. Ice and cry in pain. Do my toe and calf exercises. Use my little ball thing on my foot and just hope that it magically goes away. If there’s one thing there’s no shortage of on the interwebs it’s PF advice, half of which contradicts the others. Wear more cushion, go barefoot, don’t go barefoot, stretch, don’t stretch.. everyone is full of opinions when it comes to PF… but I prefer to sticking to listening to people’s experiences instead. I am still running Boston. It’s going to be very ugly, not as ugly as 2012, but it’ll be a tough race. I am going to run Wisconsin marathon two weeks later because I’ll be in Chicago for work and the opportunity to get another state is too good to pass up. Speaking of which, come run it with me! Code LIANA15 gets you $5 off either the full or half marathon! I might be passing on Fargo after a tough decision. Short story is that I applied and got an “elite” entry into the race. It’s not so much elite as probably more complimentary. With that, I was hoping to break 3:15 in a marathon. I have a 1:31 half (unofficial) and on a full flat course, I really believe I have hope of that in me. That was before my PF struggles and 105 inches of snow destroyed the city I am in. Long story short, while I really hate giving up this entry, and another state, the expenses of flight and lodging might not be worth to run a race in pain. I’ll give myself a bit more time to find a reasonable flight, but if I can’t, it will have to be moved down to another time when I’m running fit again. I know that’s somewhere in my future, I just don’t know if 2015 is it. So for the most part, I’ve still been running in my attempts to train for Boston. The treadmill running for the most part doesn’t hurt too much, but running outside definitely flares me up more. So maybe more cushion and stretching is the way to go for me? I’m still debating. Anyway, the on and off weekly recap. Please note the times are faster than my running in the past, because the treadmills I used now versus at my old job are easier and less “inclined” or maybe, my old treadmill was more “inclined.” Either way, less inclinement, faster time. I use the 3 setting at healthworks and on my home gym, while 2-3 at Planet fitness, but who knows what that even means. Monday – 8 Miles, average pace 7:45 was a more eased in run after my 10 mile race on Sunday. Tuesday – 10 Miles, first 8 at 7:33 pace, last 2 at 8:45 pace for cool down. I find that adding a few slower miles has really helped when I do my “Faster” runs. Saturday – Rest day, I wasn’t planning on it, but the early 5:30-6Am wake ups caught up to me and I just ended up napping away half the day. Sunday – 15 miles, average pace around 8:15 which includes walking on icey patches. My friend invited me with him on his run in Newton on the carriage roads. It’s pretty much that most runnable place in Boston and part of it is along the Boston Marathon course. It’s about 3.7 miles out and 3.7 miles back. It might go longer, but we (or maybe just me/I) weren’t sure where. Ran 7:50-55 average pace for about 7.5 miles together and then I took it easier on a second loop alone. Surprised that I was able to run without music, but the company on half the run helped a ton! And I will almost end this post on the fact that every time I type plantar fasciitis, my computer wants to auto-correct it to plantar fascist… which seems to be a more accurate description. Happy thoughts! Tell me something you’re looking forward to this week? I’m going to a foodie blogger event at Ostra on Tuesday that I’m super hyped up for! You would figure with all the free time I have from not running, I would be blogging up a storm… however, without running, I am losing my blogging mojo with it. Heel pain that’s been making running distance or speed pretty uncomfortable, not painful but severely uncomfortable happening since December. Went to PT… was very not impressed and after learning some calf and hip strengthening exercises decided that even though it’s covered by my insurance, twice a week visits were not really it. I have nothing against my therapist but just got this vibe that she hasn’t worked with my heel problem or my type of runner often. Plus it took her 3 days to email me the stretches that she told me she would. Either way, I just didn’t feel like the solutions worked for my problem. Went to my chiropractor who was able to find where the heel issue was in my heel and confirmed that it has nothing to do with planter fascitis. My PF has no inflammation and is happy as ever. Science has never been a strength of mine but basically something happened where my Gastrocnemius, Soleus & Tibialis Anterior, basically the muscles that run up and down my calf/ankle area all came into a party and had a massive rager rave in my heel. Now it’s in a constant state of hangover. Made sense to me since my left leg and side overall has been insanely tight overall. So he’ll be using I think a mix of Graston and ART. Anyway, I can’t say my heel is feeling happy this weekend (even though I haven’t done much running) but hopefully with treatment and lots of stretching I will get rid of. I’m trying to be hopefully and not freak out about the stupid goals and races I held onto. Myth ~ Inflammation is the cause heel pain. Fact – inflammation is the natural healing process of the body. It’s a ‘signal’ of tissue damage and that the body is trying to isolate and heal the damaged tissue. It’s the result of repetitive stress onto the heel that prevents incomplete healing. Myth ~ Rest is the best thing for the heel pain. Fact – rest will only minimize the irritation of the irritated tissues. The scarred tissues will not go away on its own. It’s best addressed with a pro-active attitude with ice, manual therapy (e.g. Active Release Technique, Graston Technique, Shock Therapy etc. ), proper stretching and strengthening exercises. I’m trying to keep positive as I’m sure even the elite go through periods where something is off, have a terrible, or low season and return stronger, better and PRed more than ever. I’m trying… but it’s so hard having a issue that can’t seems to resolve itself on its own. This too shall pass… I’m healthy and I’m running more than many other people wish they could… Plenty of marathons left in my future. I really hate admitting it, but I’ve been a terrible follower of my own advice. I hate admitting injuries, and taking the steps to fully recovery versus elevating them to a higher level. Absolutely hate it, and unless I am getting sharp pains, I pretty much have been ignoring issues for months now. For those who have followed me for a while, I’ve been a “runner” for over 7 years with half marathon/marathon running over 4 years now. Sometimes, I feel like a complete newbie, but yes, it’s really been that long! For those 7 years I’ve been incredibly lucky, where although I was a really uncoordinated kid growing up, picking up running as an “adult” has come incredibly easy for me! I ran my first 5K 25:28, not elite, but pretty well for a girl who spent most of her childhood being inactive and chubby. My first marathon in under 3:25 and while not always following the all righteous rule of gradual increase, I have led a very injury-free running life. The most was maybe taking two extra rest days to rest out some soreness and a cranky piriformis from lack of stretching. And then 2014 came with a string of discomfort that just couldn’t be resolved with two extra days of rest and for a while I refused to believe it. I ran my official 50 miler on what I highly suspect was a stress fracture. I still don’t regret it, because I’m not sure when I will take the time to train for a 50 miler again, but in the grand scheme of running things, I’m sure it was not my best move. And recently, as I am coming back into training and running, I started ignoring another pain. My heel… which has been on and off problematic probably since October. At first the back of it bothered me and now the outer right side is. The outer pain went away and the side pain came sometime when I was actually not running and cross training in December. And while the pain is dull and easily ignored for a bit, and boy have I done a great job of denying it’s existences; it has come to a point where I can tell it’s alternating me gait and my walking… terrible signs. So yes, once again.. I am taking a short running break. Hopefully it’ll be only a week break. I’m seeing a doctor on Wednesday to do an X-ray because while after enough poking and testing, I’m relatively confident it’s not a heel stress fracture, there is definitely some inflammation occurring and I have a terrible guess it’s a heel spur, but maybe it’s just a weird case of plantar fasciitis where the pain is on the side of the heel versus the arch? Either way, I am trying to stay optimistic and positive about what I can expect from my spring races. I am trying to contain my anxiety about lack of performance at Boston because while I would love, love to PR on that course, I can also have a blast running it for fun. I’m also hoping for a quick recovery so I can resume training for a sub 1:30 half marathon in mid-March giving me about 6 weeks of training left. After two days of easy paced “short” runs, my heel is feeling less inflamed; however, I am resting until official diagnosis and this is giving me hope that I will be okay. So why am I writing this whole speculative analysis of my injury when my appointment is two days away? Because if there’s nothing more; runners love talking about their running, and when they’re not running, they will go on and on analyzing what is keeping them from running. It’s a fixation, maybe not the healthiest, but also not the worst one either. So my week of training where I ignored all my issues Monday-Friday and then finally googled MDed myself into a panic attack Friday night. It was literally negative 3 degrees Fahrenheit in Boston on Thursday morning!!! Saturday – Fun Run with Somerville Road Runners club at Casey’s 4.1 miles. Casey’s Tavern provided a stellar brunch offering post run! I’ve been on a roll lately, race or not, I’ve been keeping my mileage high and feeling great. Of course eventually all good things come to an end. I generally try to schedule in down weeks and rest days but sometimes I get over excited with the endorphins and run on. I guess something like that must have happened because now I’m tenderly taking a few days off due to what I think is a strain. Basically the part where my foot meets my leg in the front is very cranky. It got cranky enough that I had to call my favorite driving half to come pick me up mid run! Anyways I spent the day icing and elevating and it’s feeling better to I’m only in semi panic mood. Anyways, I’m behind on two weeks of recaps so let’s get this in the books. The week of Little Rock marathon was a slow week but only because I needed a rest day from my 35 mile weekend and I spent 2 days in a car for the drive to Little Rock. 2 part run with 8 miles 7:34 pace on incline 2 and a short 5K in the evening at 7:26 pace. Progressive run on incline 3 while rocking out to the new Glee episode with Adam Lambert. Average pace ended up being 8:01! My week after Little Rock was anything but recovery. Although it didn’t feel like a mistake, it probably was. I was going to run only a few miles, but I was so happy to be back running and not traveling that I kept running a little further than I should. After Little Rock I was feeling great and wanted to keep upping my mileage. 8 miles at even 7:36 pace on incline 2 and 6.3 miles later in the evening at 7:37 while watching Nashville. 8:33 Pace. I was going to do a long run but my effort was all off. My path that I usual run 7:30s on were turning into 9 min miles and so I cut my run short. Nothing hurt at this point but I sensed an overall fatigue. This run actually started of fabulous. Cutting my run short on Saturday seemed to add an extra kick to my run! And then around mile 10 I started to feel a pain in my lower shin or top of foot and within a mile I could barely walk. I didn’t fall or trip or anything weird, so the only thing I could think that caused the strain might be the hoping over puddles and mud craps from all the snow in my area. Either way, I stopped my Garmin around 11 mile mark when my average pace was still 7:57 and tried to walk my way home. About a mile away I got picked up where I iced and rested my foot and thus my little drama fest began. I did take an hour break to crash Brandeis University’s SpringFest to see Fun, all to realize that I however, am no longer young. B At least not college age young. Monday I behaved well… I bypassed the treadmill andB ellipticaledB my way through 10.5 miles of sweat. Tuesday… well I just couldn’t say no to my love and stumped out 7 miles in 57:30. B Great speed; however, I paid the price when I stopped and my shin/knee locked out and I had to sit on the floor for a moment to stretch my leg and gather my strength. The rest of the day I sat at my desk icing my leg silly. B I’m pretty sure I gave my shin freezer burn from all the zealous icing. 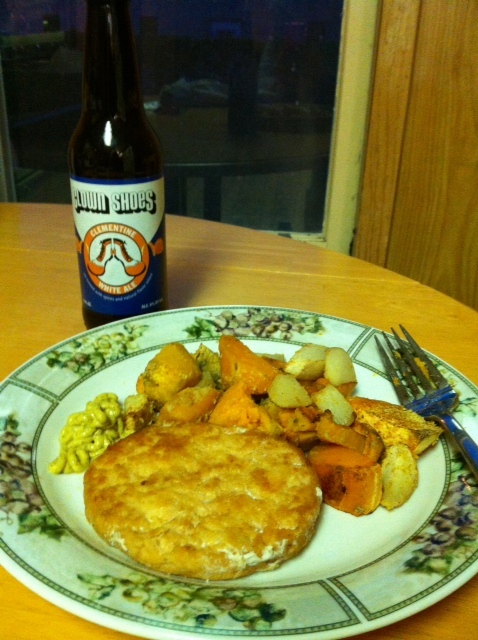 B Well the good part since I am no longer running after work; I can cook. I roasted sweet potatoes and parsnips in the oven seasoned with nutritional yeast and paprika for a cheesy but spicy flavour. B I was secretly craving thoseB kale chipsB B I had a week ago but was too lazy to go to the store to buy kale so I tried to improvise. I also cleaned/threw my house apart searching for my powerstep shoe inserts while Tony quoted “Born to Run”B minimalisticB propaganda and made fun of me. B I used the shoe inserts when I had a minor stress injury on my foot from hiking (I seem to always get hurt when I do non- running activities). Yea, it’s perfectly normal to eat chocolate by the pound. 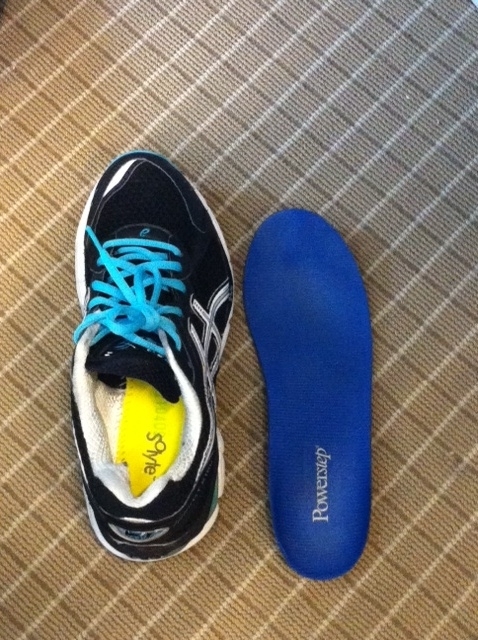 Luckily today when I got to work, I found my powerstep insoles. Between busy times, the free gym, and the awesome showers I’m pretty sure I live at work. Now I knew I should have behaved, moved away from the treadmill and went to the elliptical. B Part of me was hoping that the guy that usually steals my treadmill would be there so I would be forced into remission. B No such luck, so I lost my self-control, put some trust into my PowerSteps and started up my run. I was very weary and was expecting pain at any moment in my knees; however, before I knew it, I was at mile 5 with no issues and decided to stump it out for a total of 7 miles in 58:08. Now knee, before you protest, please take note that I’m keeping the incline at 2 instead of 3 to have a more flat surface for you. B Don’t say I never did anything for you! I don’t completely ignore my pains, I’m lowering my incline for you (and probably for me so I can run easier). I was also surprised that I was able to keep my pace at the same speed as I ran without the inserts. B Last time I used them they slowed down my runs as my ankles/calves would get to tired. I swear on my running shoes that on a normal day-to-day activity I almost never sweat but, as soon as my feet hit the pavement (or treadmill) it all comes out!